Among the amazing moments I experienced in the Copper Canyons, seeing the Raramuri run in their homemade huaraches (sandals) is definitely one of the most memorable. As I watched them fly up and down rugged trails in this simplistic footwear, I couldn’t help but wonder if there was some sort of hidden secret to the running sandal, so I went to Señor Ventura and asked him to cut and fit me a pair. I had to try it for myself. There is really no way I could walk, let alone run, in a pair of heavy rubber soles clinging to my feet only with a thin leather lace. This would require weeks (and many layers of blistered skin) to get used to, and there was simply no perceivable incentive for me to do so. So when I saw the “Luna-tics” crew come to town in their modernized huaraches, I really didn’t think they would be able to run the Copper Canyon Ultra with their super-thin, lightweight sandals. To my astonishment, they all did, and with a fair share of success. I ran the last 8 miles or so with Scott Smuin, one of the founders of the Luna Sandals Company, and told him how impressed I was to see them all run on such rugged terrain with such little protection. “I could never do this”, I told him. “You should try”, is what he answered. He sent me a pair of the Leadville model, which I understand is their thickest sandal. It is designed for trail running and takes its name from the famous Leadville 100 ultra, where it was originally tested. At first, I couldn’t believe I would actually be able to run with a 10mm piece of neoprene rubber tied to my feet by only 3 points of contact. So I went for a conservative, step-by-step approach. I started by wearing the Leadville for walking around, to break them in and get over my worries that I would stub the soles and tear them off my feet. I also had to be convinced that the strap between my big and second toes wouldn’t chew through my skin or provoke severe blisters. None of that happened. I brought my Leadville on a recent backpacking trip to Portugal and ended up wearing them every day. I started really liking the soft cushioning they provide while still allowing terrific proprioception (ground feel). I wore them on day trips, long walks on cobblestone streets and small treks, and my feet never got bruised or tired. I thought that was pretty good. The only thing that bugged me was the ribbon/plug system that holds the front strap in place. The plug moves inside the sole and eventually twists the lace in between your toes, significantly affecting your comfort. I plan on gluing the plugs in place to solve this issue. When I got to Lagos and learned that the town was surrounded with cliff-top trails, I thought it was time to see if my Luna Sandals were meant for running after all. I had gotten used to the ATS laces, a mix of soft ribbon and elasticized straps that hold the sandal in place while allowing natural foot movement, so I felt secure enough to take them for a spin. 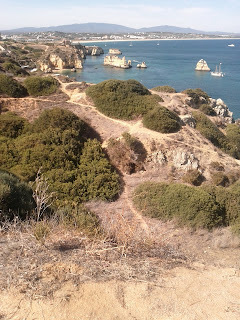 The trails atop Lagos resemble the ones in the Copper Canyons, although they are less rocky. I started running along the hard-packed, sandy trail and quickly felt at ease. The Leadville didn’t feel too loose or too tight, and reacted very well to whatever my feet did. I picked up the pace. The soft sole absorbs the sharp features of the terrain really well, so I wasn’t afraid to get hurt on pointy rocks or thorny roots. On steep uphills, I was impressed with the Leadville’s firm grip. It behaved equally well on grainy descents, even though I wasn’t as brash in my running as I would’ve been if I wore regular trail shoes. I ran several miles of rough trail that included some very sharp drops requiring light rock-climbing, and my Leadville never failed me. Although I didn’t feel ultra secure, I was able to run as free and as hard as I wanted, which greatly impressed me. On my way back, I reflected on why, as a trail enthusiast, I would choose to run in sandals. Since I can’t use them year-round (there’s a real winter up here in Canada), I concluded that they could only complement my footwear options. However, they are fantastic to bring in backpacking trips (they are so light and thin) and I would seriously consider wearing them when running in high heat, as my feet never got sweaty. Needless to say, as a regular sandal, the Leadville is downright awesome. The equipment for this personal review was supplied by Luna Sandals, free of charge, without any conditions. I tried the Luna sandals last October, but for whatever reason I could not run in them. I posted a review on my blog, http://home.kc.surewest.net/leonw/, as well as in my recent book. I also asked BFT to comment on the book, but last I heard it was part of his "summer reading." (It's only about 35 pages). So still no review on Amazon. Also just noted your comments on running technique. Like always, we seem to insist on having some kind of scientist bless whatever we do or we don't feel secure enough to do what we fee like. They are, however, excellent non-running footwear, in my opinion. Sorry I meant *stick* to a specific style.